Details: Come try your luck on St. Patrick’s Day and decorate your own pots of gold! Transform our Chocolate Covered Oreos into your own Celtic creations! Each Pot of Gold is $1, and there’s no limit to how many you make! The event will be fun for the whole family! We look forward to celebrating with you! Location: There is power in every GIRL, especially a Girl Scout! Details: It’s called GLAM (Great Leaders And Mentors) Power! Calling all Girl Scout Troops to join us for our annual Girl Scout Day Celebration. 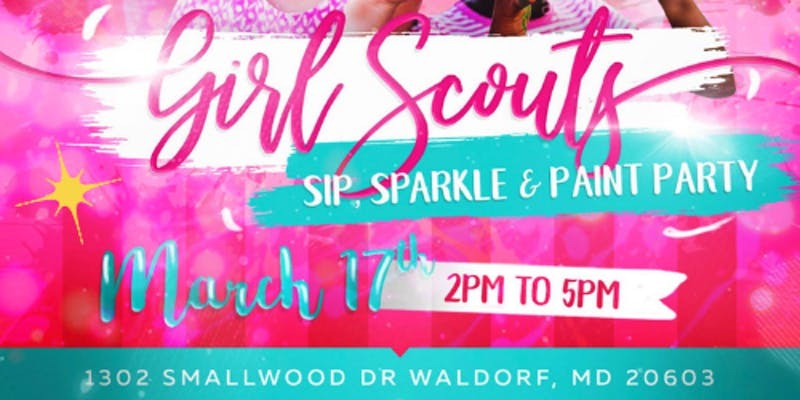 Light Refreshments, Canvas Station, Selfie Station, Karaoke, Girl Chat and the Troop with the most attendees will receive a spa treat. Troop Contest: Show off your Troop creativity and design a GLAM Power poster indicating your troops GLAM Power. Details: Celebrate National Craft month in March with a craft to go. Details: Did you enjoy Cookie Trivia? You’ll love Cookie Challenge! Catch the beach ball, answer a question about a book, graphic novel, or movie and win a cookie (while supplies last). 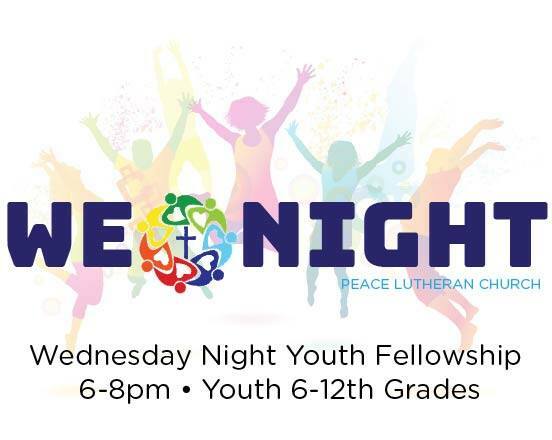 Age Group: Recommended for teens 12-18. 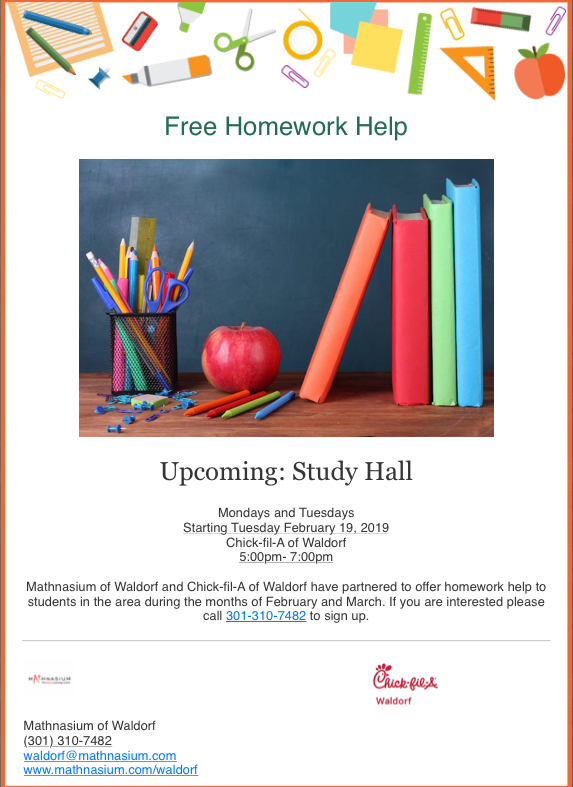 Details: Mathnasium of Waldorf and Chick-fil-A of Waldorf have partnered to offer free homework help to students in grades 2-12. Come join us for Study Hall on Mondays and Tuesday from 5:00-7:00pm nightly throughout March. 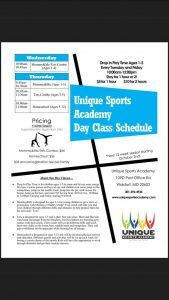 Call 301-310-7482 for more information and to sign up. We look forward to helping students gain confidence in math. Details: Create 3 fun Shamrock inspired crafts using paint, construction paper, and coffee filters. Details: Join us for stories, songs, and hands-on experiments to learn about fossils, sound, seeds! Age Group: Recommended for ages 2-5. Details: Free Admission to the Playseum on Tuesday, March 19 from 6-8pm!! Our Group will be on hand to answer any real estate questions & share in the fun! 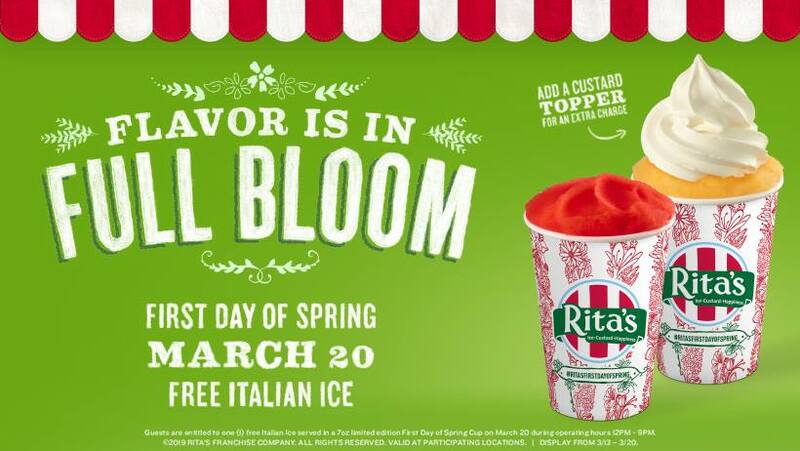 Details: Enjoy your first taste of spring with Rita’s and FREE Italian Ice! ? 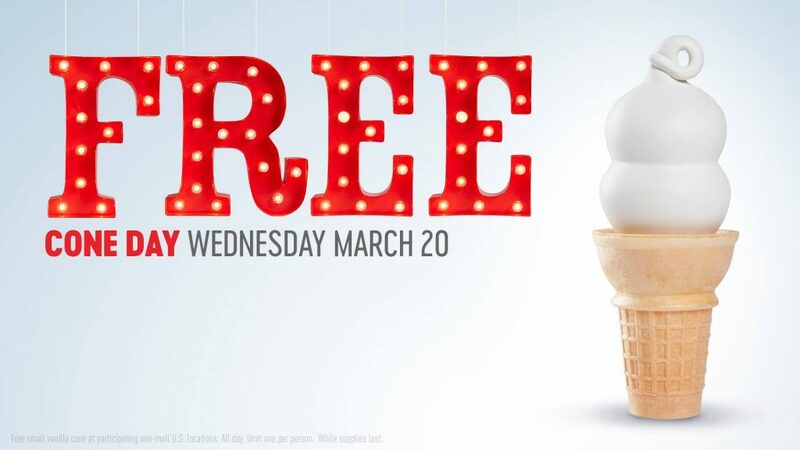 Stop by Rita’s for our annual First Day of Spring FREE Italian Ice Giveaway on Wednesday, March 20, from noon to 9pm. All Guests who visit Rita’s Italian Ice will receive a a FREE promotional size cup of Italian Ice in the available flavor of their choice to celebrate the arrival of SPRING! Remember to capture you favorite First Day of Spring moments and share them with us on Facebook, Instagram, and Twitter using the hashtag #RitasFirstDayofSpringContest! Details: Vome enjoy a special open jump available for children and parents that home school. Come join us at Pump It Up for a few hours of jumping, socialization, and creative time. Be sure to call ahead! Details: Bring the family to Waldorf West’s Imaginative Playtime Room and enjoy a family-friendly, G-rated movie and some imaginative play. One ticket per person (even infants) will be handed out one hour before the program. Children under 8 years of age must be accompanied by an adult at all times. In March we will watch The Little Mermaid. Recommended for ages 0-5. Details: Come see New York City like you’ve never seen before! Explore the city using Google Expeditions VR goggles. aloud creates memories and encourages critical thinking! Light snack included. more! Classes are so fun, even parents like to join in. No prior yoga experience necessary. Details: Want to try field hockey to see if it’s for you? 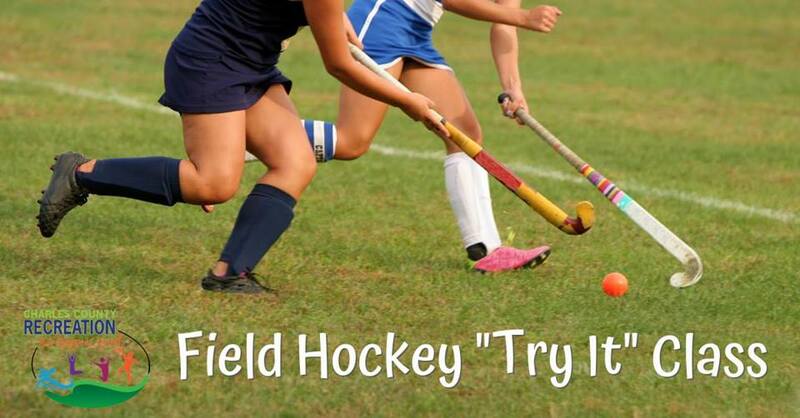 Come to our two hour Field Hockey “Try It” class to get introduced to the sport! You will have the opportunity to play and learn about field hockey through the development of core field hockey concepts including proper grips and posture, ball and stick control, tackling, receiving and trapping, passing, and many other fun skills! Sticks and balls are provided. 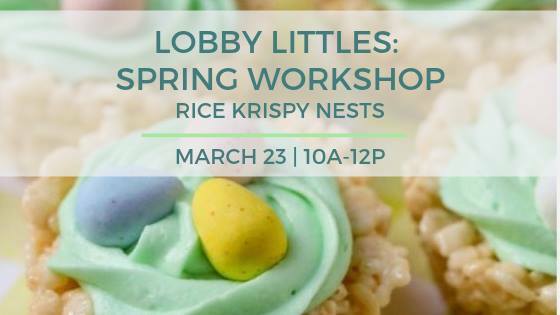 Details: This story time encourages emerging literacy skills through books, songs, fingerplays, and flannel board stories. 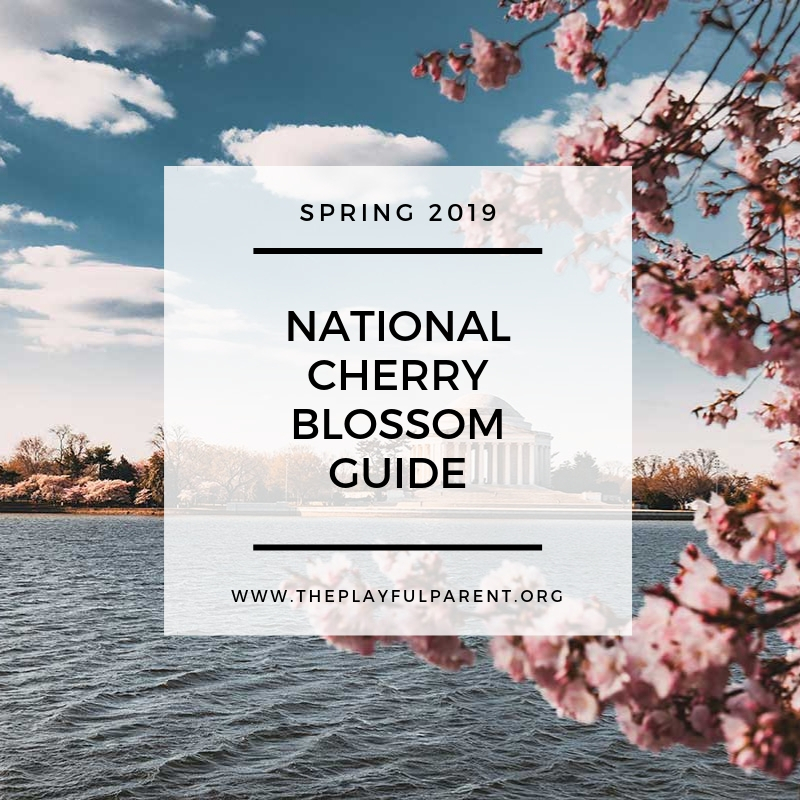 It is designed for children of multiple ages and their parents. This is a 30 minute program that includes a simple craft. 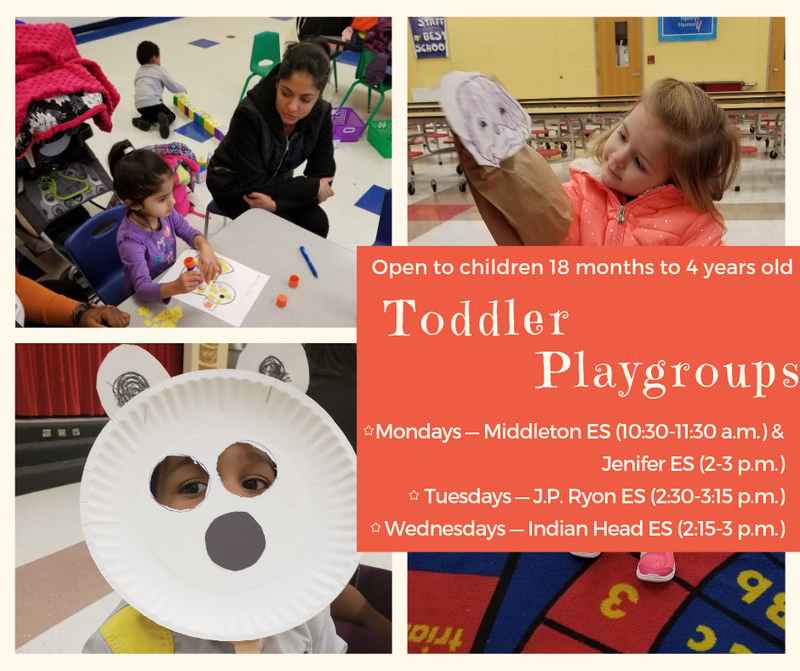 Details: Toddlers love getting creative and messy! Explore your toddler’s artistic abilities as they create their own masterpiece. All supplies provided. Adult participation required. Registration strongly recommended. Details: Ever wonder what happens to animals during the winter months? We’ve got a story and some animals to help explain where they would be during the winter. 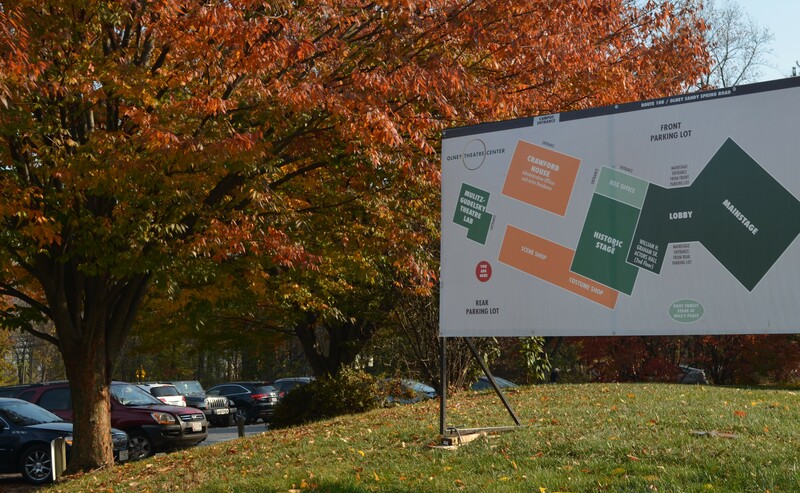 Join us at the Community Rec Center! Animals courtesy of Echoes of Nature. 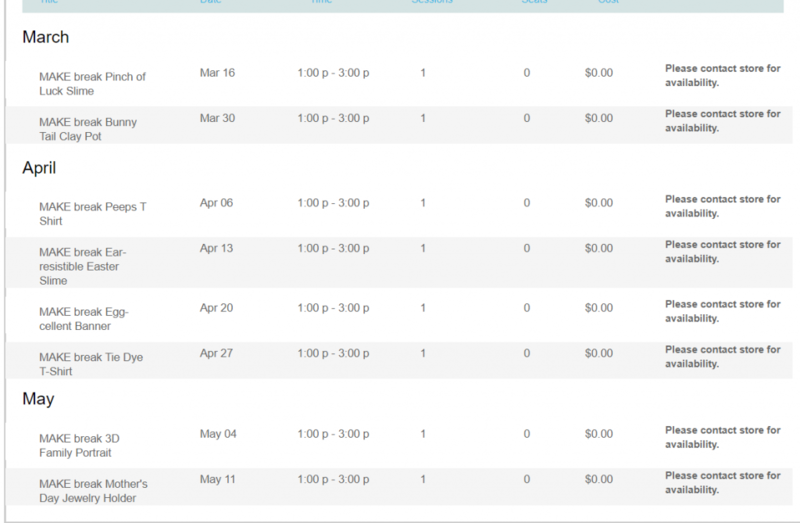 Reserve tickets in advance to save! “From classical to gospel, this trio is best known for their unique and skillful a cappella arrangements. Joseph Clarke, Jessica Fox & Mariah Hargrove make up the Richmond, VA based trio, RESOUND. Their mission is to encourage and provoke individuals to share their God-given gifts and talents with others, just as they have. Spring Cleaning for your Closet! 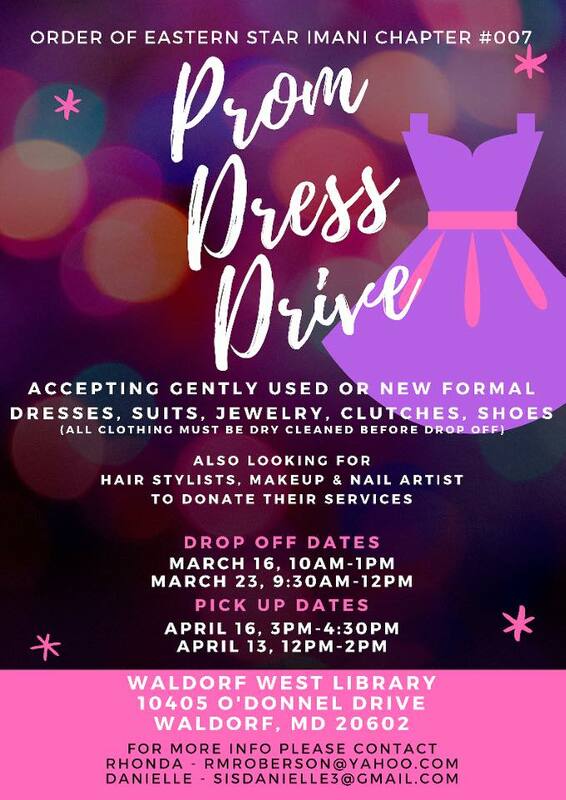 Christ Episcopal Church is seeking donations of prom dresses, suits, and accessories (jewelry, shoes, men’s dress shoes, shirts, dress pants and jackets, ties and bowties) to help students in need in area high schools attend their proms. All items, as well as gift cards or monetary donations to be used for salons, florists, restaurants and transportation, can be dropped off at the church’s main door at 112 Charles Street (facing onto Charles Street) on Saturday, March 23 from 9-1, or Sunday, March 24 from 9-1. The church is located next to the Courthouse. With some 750 children in Charles County public schools homeless or in transitory living, there is a great need. “This is a tangible way to show young people who often feel overlooked that they matter, that we care that they participate in this central rite of passage in high school life,” says the Rev. Steve Seely, Deacon at Christ Church. There are various programs of support for elementary age children and families, but fewer for high school age students at risk. Christ Church is developing programs to reach out to some of these students, starting with Prom4All. 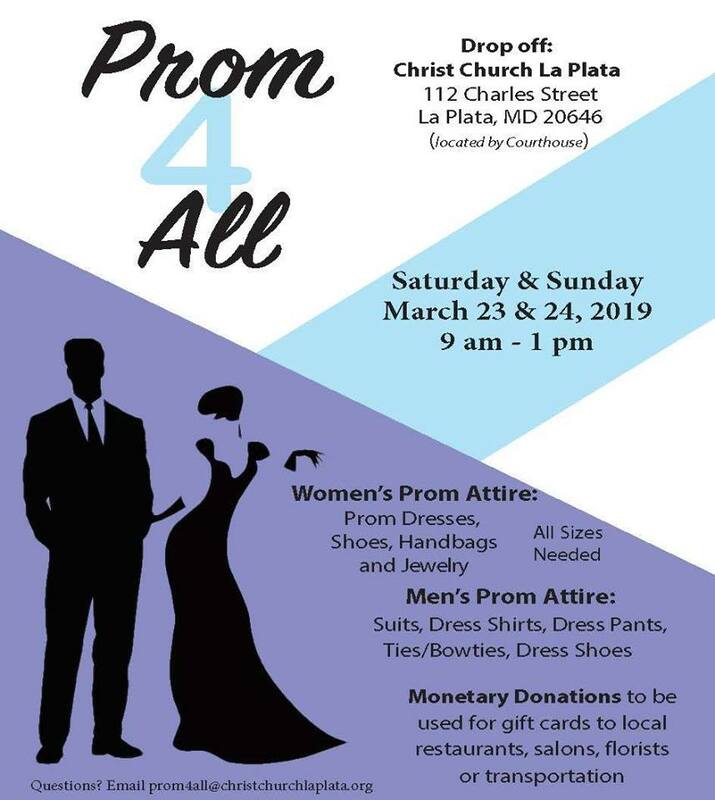 Questions can be directed to prom4all@christchurchlaplata.org. Details: Celebrate Maryland’s 384 anniversary with ceremony, pageantry, speeches, and free admission to living history and museum exhibits. 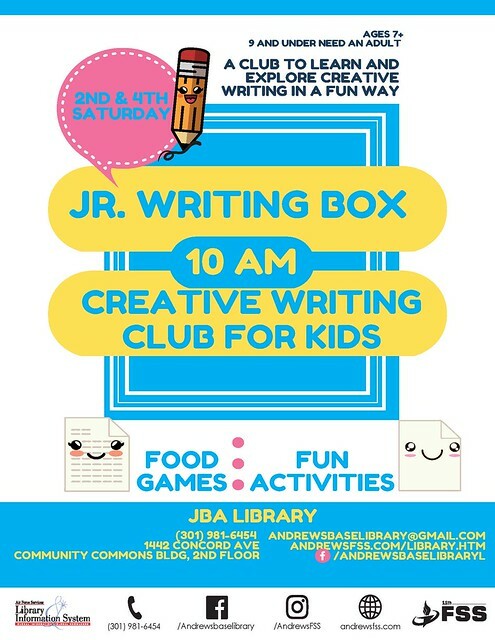 Details: Join in this fun club that focuses on learning and exploring creative writing in a fun way. Details: This story time is a monthly program that is scheduled for every 4TH Saturday and includes books, songs, fingerplays, and flannel board stories. It is designed for children of multiple ages and their parents. This is a 45 minute program and a simple craft is included. Join us as we celebrate slime time at SLIME EXPO DC! The DC metro area’s LARGEST Slime Expo! Meet & Greet your favorite Slime Brands! Age group: Everyone! Brint he whole family. Under 16 not admitted without a parent. 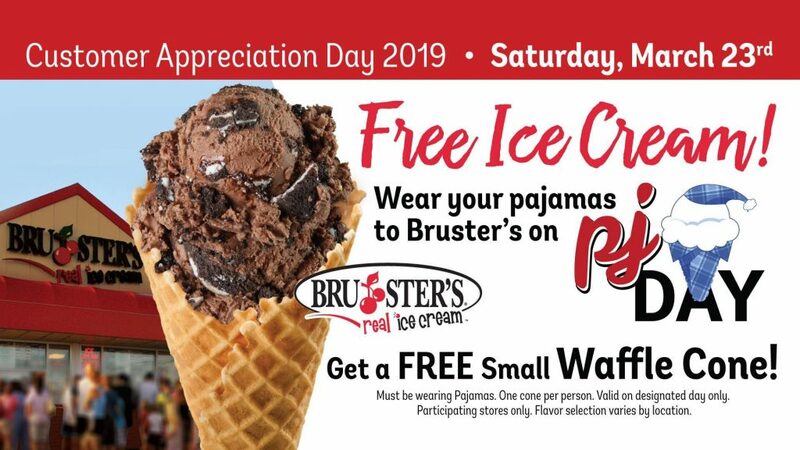 Details: Wear Your PJs and get a FREE small waffle cone! King’s Christian Academy proudly presents Anne of Green Gables! 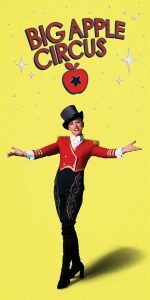 This family-friendly play Details: captures the charm and excitement of L.M. Montgomery’s enduring classic about an orphan girl, Anne Shirley, from her first encounter with her austere guardian to her thrilling graduation from Queen’s Academy.